Description Onshore winds have been keeping the Puget Sound lowlands cool and cloudy, but sunlight and warmer temperatures are returning. 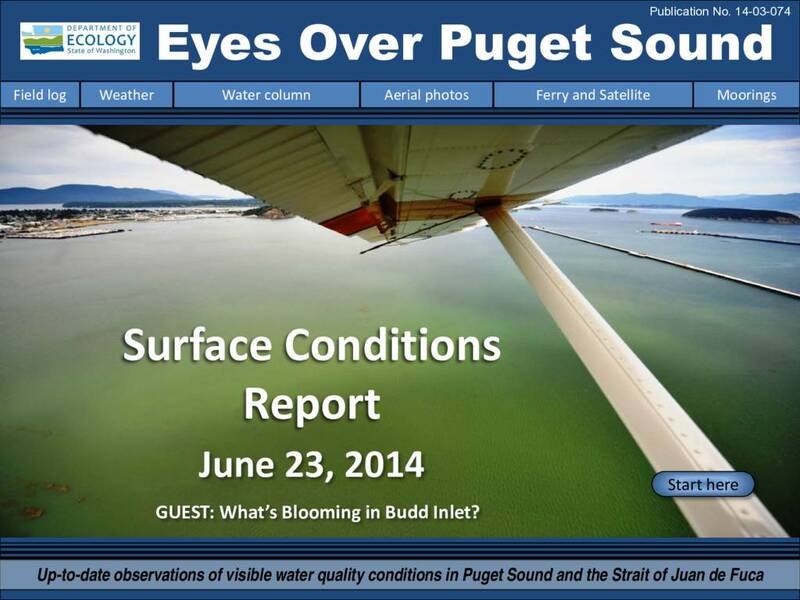 Large organic mats of surface debris in Hood Canal, Padilla Bay, and Lay Inlet; many are macro-algae. Strong red-brown blooms in Discovery Bay, East Sound, and parts of Georgia Basin. Sediment-rich water north of San Juan Islands. Jelly fish are increasing in numbers. Colder, saltier conditions in early 2014 and lower oxygen in Whidbey Basin, Central, and South Sound continue. Hood Canal remains unusually cold. At our Mukilteo mooring, temperatures are similar to last year, but salinity and dissolved oxygen follow the Puget Sound-wide trend. Guest feature on phytoplankton monitoring, plus an in-depth look at our mooring program. Our technology now hitching a ride on the state ferries!